Federal officials looking to improve their online services to the public are discovering a unique contracting model, used by a growing number of state government agencies, that offers a potential fast-track solution at no direct cost to their agency. This public-private partnership model, often referred to a as “transaction-based” or “no-cost” contracting in the federal government, relies on transaction fees paid by users of the service to fund the costs of digital services. The benefit to agencies is that none of the funding to develop or improve an online service need come from the agency’s general budget. Agency officials provide the overall direction, but assign delivery responsibility of the design, administration, and maintenance of the digital solution to the private contractor, transferring some of the risk and accountability while freeing agency personnel to perform other, mission-critical tasks. The result, according to a FedScoop special report describing the process, is a win-win for agencies and the public: Agencies are able to deliver the services citizens and businesses need in the digital format they prefer, all with minimal impact on the budget — or none at all. The report, underwritten by NIC Inc., highlights how government agencies have been able to accelerate their efforts to deliver enhanced online services using the model. The U.S. Department of Transportation, for example, worked with NIC to design and deliver the Pre-Employment Screening Program (PSP) for the DOT’s Federal Motor Carrier Safety Administration (FMCSA). This digital government service allows authorized trucking and bus companies to review the crash and inspection histories of commercial drivers during the hiring process. But like many federal initiatives, DOT officials had to deliver the service as part of a mandate that came with no additional funding. By using a no-cost contract, with fees paid by the end-users of the service, DOT was able to develop, operate and promote the digital government service all at no direct cost. The results have been impressive: An FMCSA study found that carriers using PSP to inform their hiring processes contributed to, on average, 8 percent fewer crashes and a 17 percent lower driver-out-of-service rate than those that do not use PSP. The State of Maryland used a similar transaction-based approach to digitize and streamline its business licensing process that saw approval times dropped from 10 weeks to as little as one day, according to the report. The report provides details on how agencies can utilize existing government procurement rules to take advantage of the no-cost contracting approach. It also provides recommendations for the kinds of government services best suited for transaction-based and no-cost contracting models. 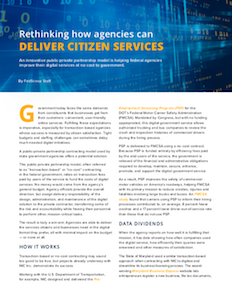 Download the special report and learn more about how NIC is helping federal agencies enhance the digital government experience. This article was produced by FedScoop for, and sponsored by, NIC Inc.